jennie's nails and tales: the nail files: dot it to me! It's been a challenge on the nail front lately. Mostly because I haven't had a ton of time to troll Pinterest, but there's been the added challenge of repainting our kitchen cabinets, which have made wearing polish almost impossible. But not to worry because the painting is almost done. *eyeballs cupboard doors that are only painted on one side* Okay, so they're only about halfway done but still, that's progress, right? Haha! And it was while I was painting that I noticed a clean line of dots on the drop cloth, thusly inspiring a new mani that I rushed inside to try. Fine, I didn't "rush" as much as I "walked" but that doesn't make for a good story. Ha! In any event, I found inspiration in an unlikely place and isn't that just the best? Hint: the answer is YES! I forgot to include Paper Mache by Finger Paints, which was the base colour. At first, I was happy with the look of all the pretty sort-of-gradient colours but then I realized there weren't any sparkles. To start, I did two coats of Paper Mache and when that was dry, I got out a medium dotting tool and got to work. Using both ends to make different sized dots, I started with the lightest blue on my pinky, At Vase Value, and then continued along with Too Yacht To Handle, Highlight of My Summer, In the Lime Light, and then Shake Your $$ Maker. 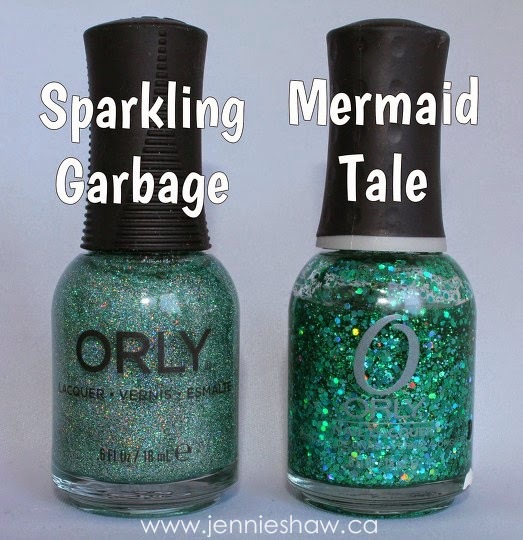 And after the Lack of Sparkle Calamity, I added a few glitter dots on my ring finger with Sparkling Garbage and picked out some bigger glitter bits from Mermaid Tale, breathing in a sigh of relief that it all worked out and I was shiny again. Haha! The lightest green and blue seem washed out in the outdoor pic but rest assured, they're bright and awesome in real life. I REALLY love the bigger glitter bits on the green dots, so I'll totally be doing that again, and the overall look of this mani is fun without being so bright that you need sunnies (is that better, Beth? Haha!). I mean, are you for real? This is such a perfect manicure and the simplicity of it just blows my mind! I love it entirely too much and maaaaaaaaaay be doing some kind of variation of this to copy you stat! I wish we lived closer. That way you could paint my nail one day. I have to get some Orly polishes. Holy frak- I LOVE it! I want to try this myself...I only have one size of dotting tool, but (FINALLY!) I feel inspired...thank you! You've done it again ;) I love your nails, their so pretty. Great colors too!